As a little girl, I loved professional wrestling. It was always on in the house and I loved the spectacle of it all. I remember sitting on my moms’ bed on a Saturday morning watching the weekly highlights. We watched every Pay-Per-View. I played with my brother’s wrestling figures in the ring and would act out all the entrances. This little girl wanted to be a part of that so much, but knew she would never fit it with the women on the television. You see, as a woman now in her early-30s who is all of 5-foot-3 and tiny, there was no place for me. I couldn’t imagine someone like me would ever be taken seriously in the business of professional wrestling. I decided I would do the next best thing — I would go to school for communications with dreams of being on the WWE announce team.While that did not come true, I still watched the product and saw something happening. Women were coming in to the WWE with all different backgrounds, builds and athletic abilities. These women were doing something little me never thought would happen. I remember the first time I saw Sasha Banks and Bayley – I related to them so much. I was at Wrestlemania this year in New Orleans, checking off a huge bucket list item. Seeing Charlotte and Asuka in person was something I knew would hit me hard, and I was right. I cried during that match. They were amazing — and not just “amazing for a woman’s match”. It was truly a moment I will never forget. I was home alone watching Raw the night that Evolution was announced. Tears streaming down my face. Pure joy and validation was going through me. I felt so excited for all of the little girls watching, and for all of the women around the world who are taking a chance on a dream to be in this business. I thought of my friends’ twin girls, who love to play wrestling on the trampoline. Of my nephew, who can see strong powerful women and will grow up in an era where this is normal. Evolution was exactly what it needed to be. From the order of the matches (for the most part) to the outcomes. Every single superstar that was out there made it their mission to steal the show. It was entertaining, hopeful and most of all, groundbreaking. Stars were made in Toni Storm and Liv Morgan. Storylines were built. Respect was given to those who were a part in making this all happen. They were given the time they deserved. Not to mention, the crowd was on fire. I think the thing that really struck me last night was the amount of men in the crowd. I don’t know why, but I wasn’t expecting that. Hearing it was a sold out crowd gave me chills. The reactions and emotion they helped put in to every match was uplifting. It honestly may have been one of the best shows of the year. Becky and Charlotte stole the show. There is no debate about that. They are in the best storyline in the company and have the best chemistry as well. These are two women who were at the center of this push for women’s wrestling, and they deserve the attention they received. Becky is a star. She has been using social media in the correct way to build her character. She should be the Smackdown Women’s Champion for a very long time. 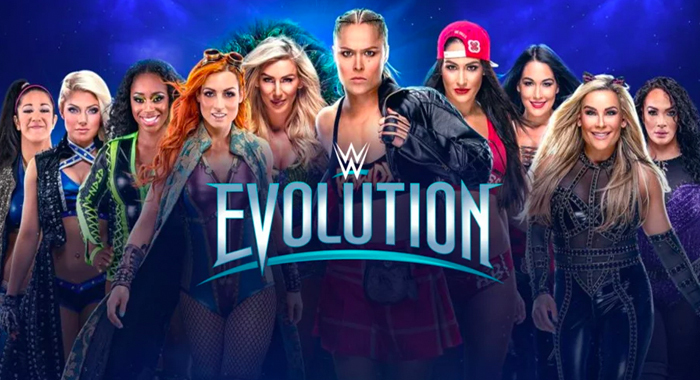 Every single woman who helped make WWE Evolution happen deserves to be applauded. I loved how all of the women interviewed were so humble but confident. Most of them would say that they were ready for this to not be talked about as the “first time ever” or “making history”. They want this to be seen as the norm. After last night, I truly believe they are well on their way. Thanks to Steffany Rubel (@sas_rubel) for sending in the above editorial.